The perfect outfit can be easily completed with a great heel or boot, especially when it comes to giving your look that extra je ne sais quoi. But when you’re spending long hours on your feet, there's nothing most women would rather wear than a cozy pair of cute house slippers. Thankfully, what used to be a trend reserved for your evenings at home or traveling has now made it on to the streets outdoors, on many an It girl, at that. And when you need to give your stilettos a break, there isn’t a more comfortable (and chic) alternative. We decided to take a style cue from these trendsetters and found our 12 favorite slippers to wear the next time you want to be comfortable and stylish. From embellished sandals that make a bold statement to polished slides that complete your look, see how others have taken to the trend. Then, pick up your favorites and put your own spin on house slippers. Read on to shop our favorite house slippers. A pair of sleek loafers will keep your look polished. A simple slide is a chic and comfortable alternative to heels for any outfit. Planning on lots of walking? There's nothing cozier than slippers as the perfect travel shoe. Eye-catching, embellished slippers will make a statement. Faux fur slippers will add extra texture. 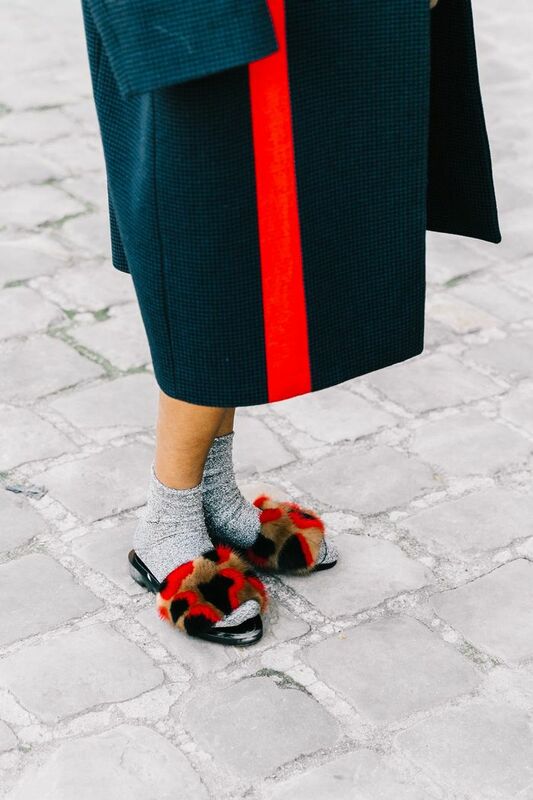 Pair your slippers with socks to make the trend extra cozy. Contrast your colorful dress with a pair of white slippers. Available in size 35 to 41. Talk about a bold shoe. Available in size 35 to 40. The floral details make this slide so pretty. Available in size 5 to 7. It's hard to resist feeling these! Available in size 5.5 to 9.5. Available in size 34 to 42. Everyone needs a little Gucci in her life. Where these in or out of the house. Bright and cheery yellow makes these stand out. Available in size 38 to 42. These will definitely make a statement. Available in size 6 to 7. How fun are these slippers? Available in size 35 to 39. Wear these with jeans or with your pajamas. Traveling for the holidays? Make sure you have these sweaters.